Destination Weddings for Kauai, the "Garden Island" of Hawaii. Elope to the best Hawaiian Island on which to marry! Let us make it Hawaiian Style for you. From the perspective of someone (Mark Steffan, the business owner) who has done thousands of weddings and vow renewals on the Island of Kauai" it is simply the best". Since we do the same weddings and vow renewals on the other major Hawaiian Islands (Oahu, Maui and the Big Island of Hawaii) I speak from experience when recommending Kauai. It is certainly the most romantic and tropically lush. 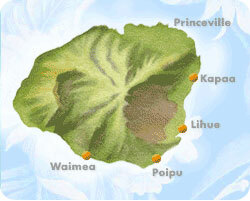 The nickname for Kauai is the "Garden Island". The 3 main tourist and wedding site areas are classified by their gepographic orientation on the Island. Starting on the North Shore we have the Hanalai and Princeville, the Eastern Shore has the towns of Kapaa and Lihue with the South Shore you have Koloa, Poipu and Waimea. We have fabulous wedding sites in all these areas.